"It is not acceptable that after months of work of all the stakeholders to improve the safety at the races, we are still seeing episodes such as the fall at the arrival of the twelfth stage of the today's Vuelta!" - This is the first comment by Gianni Bugno, president of the association of professional riders - after the today's incident at the stage of the Spanish race. "I am really tired of seeing this superficiality in applying the regulations set out in the Organizer Specifications. This lack of attention from the organizers demonstrates a total lack of respect towards us that have worked hard to improve the safety at the races and a total lack of consideration towards the riders. We are no longer willing to accept post apologies for foreseeable accidents. The organizers must do their duty and must be penalized if they do not comply with the regulations. 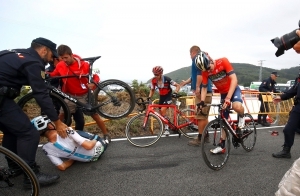 The UCI must intervene to verify that the regulations are respected. There are no extenuating circumstances. We are very disappointed by this latest lack of attention towards the riders and towards all the work we have been doing for months. Cycling is becoming a dangerous sport rather than improving and this time we are no longer willing to listen to those who do not respect the rules".